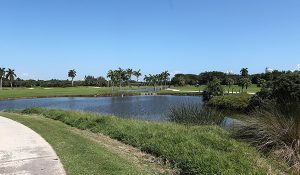 One of the things that has always irked many golfers traveling to Miami Beach for vacation or business, your choices to golf always involve lots of driving. 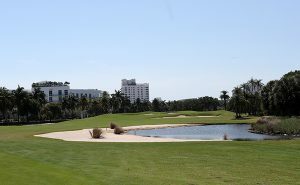 Well that’s why we decided to give Miami Beach Golf Club a look of our own and find out why this course continues to generate the ratings it has since it was redesigned and re-opened in 2002. Pioneer developer Carl Fisher developed the golf course to lure wealthy winter residents from New York, Indianapolis, and Detroit to the Alton Beach subdivision. The original course opened in 1923 under the name Bayshore Golf Course and since then has been gaining popularity year after year. Situated mere blocks from the famed A1A and the lavish nightlife South Beach is known for is a golf club that screams beauty and pristine Florida like no other. From the time you walk into the clubhouse until the time you tee off, everyone here is at your service and make you feel welcome. This is one of the many reasons why guests have said it is closest to a country club atmosphere in a public course setting. This course is heavy on the dog legs and water placements to keep you on guard. The layout is excellent with many bunkers at the right spots along with plenty of elevation changes keep you interested in this well designed beauty. This course could be a little challenging for the higher handicapper, but still a fun course all around. Your pace should be around 4 to 4.5 hours, which will still leave plenty of time to hit the beach if you so desire. Our most challenging hole on the course came at Number 3. Difficult and beautiful from every tee and usually against the wind. This par three is almost all carry over water and the best position is on the right side of this enormous rolling green. While playing conservative on some of these holes is the trick to really enjoy this course, don’t be afraid to unleash the driver on a few of the par fives. You will find the 5th hole one of the most friendly Par 5 holes on the course. Many golfers will admire all of the wildlife that is found on the course, which includes quite a few iguana families sunning their bodies on the fairway. The vast amount of wetlands that surround the course will have you looking for swimming iguanas and jumping fish. Many species of birds and speckled chickens will have you stopping for pictures throughout the course to admire the picturesque surroundings and all of Mother Nature’s creatures. The driving range and putting green practice areas are top notch as is the personal service that you get here. Inside of the clubhouse you will find amazing service from the golf shop and all of the latest apparel from the likes of Nike, Adidas and Under Armour. One surprise for us was the amazing food options that you can order for your turn on the 9th hole. 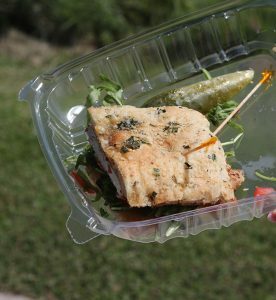 Their Balsamic Chicken Sandwich on Focaccia bread is one of the best sandwiches in South Beach. Trust us on this one, we have tried quite a few of them. Keep your food close to you as the large birds will swoop into your cart to an opened food container to steal the delicious food and entire bags of potato chips! If you are looking to improve upon your game, then we suggest trying the Jim McLean Golf Academy. Plenty of improvement options to work on all parts of your game. If you are thinking about one day doing this professionally, this is the place to start. Who wouldn’t like their score to be a little bit lower?